If you’ve ever had an eyelash or dust in your eye, you know how irritated your eye can get even after the offending item has been flushed out: your eye wells up as it goes into high gear producing tears to protect itself, and your nose starts to run (because it’s connected to the eye by a tear duct). Meanwhile, you try to reassure the people around you that you’re not experiencing a meltdown. You ride it out for a bit, the irritation soon subsides, and life is good again. No biggie. But if you’ve ever sustained a real injury like a scratch to your cornea – you’ve probably marched yourself to the doctor and had it looked at right away; and I bet you didn’t waste time Googling a diagnosis or a home remedy before you did. Besides the fact that it hurts like a…(well, you know), it’s your eye, and you’re not about to take any chances with something as important as your eyesight nor should you. While the same concern should hold true for our pets, all too often, pet owners fail to recognize that there’s a problem in the first place or choose to ride it out to see if it gets better on its own. Meanwhile, the condition can get worse and lead to some unfortunate, costly and avoidable complications. Any eye issue in a pet is a must-see matter (no pun intended) and the sooner the better! 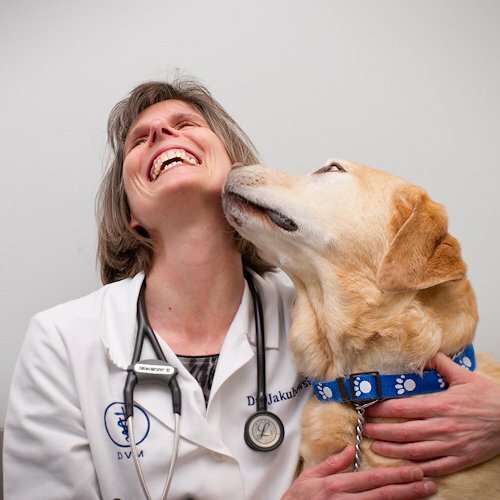 Signs that your pet needs to be seen by a veterinarian and not “Dr. Google”! And not just treated with a tincture of time or whatever drops or ointment you happen to have at home! REDNESS of an eye, or structures around it. Allergies can make an eye red, yes, but so can many other serious conditions that can lead to blindness. CLOUDINESS of an eye. Unless you have the proper training & tools, you can’t tell the difference between a cataract (which isn’t a medical emergency) versus say, corneal edema (which spells big trouble and does require immediate attention). A BULGING eye, or swollen structures around it. Persistent or excessive TEARING from an eye. A RAISED THIRD EYELID. This can be a sign that an eye is trying to protect itself when it’s in trouble. Things can go south pretty quickly where an eye is concerned. A couple of examples: Uveitis can interfere with drainage of an eye, which in turn can lead to increased pressures in the eye (glaucoma), which can lead to blindness in as little as 24 hours. A simple corneal ulcer can lead to a melting ulcer – and now, we really are having a meltdown, and the eye is at risk of rupturing in a matter of days. (That’s what’s going on in the picture above.) Going blind is bad enough; but the endgame in some of the cases we see is enucleation – that is, removal of the eye. The sooner we get on top of a problem, the more likely we are to prevent serious consequences. If you stop treatment too soon, the problem being treated will recur, and could potentially become harder to resolve. So: your pet’s eye looks a lot better, and she’s back to her old self, with no more squinting or rubbing; and you figure that since things have cleared up, you can skip/cancel your recheck. That’s a big mistake. Your pet feels better because she’s healing; but that doesn’t mean her condition is healed. There’s a big difference between the two. 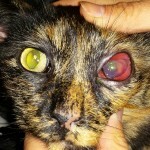 Most eye conditions need to be monitored by a veterinarian – who, after all, has been trained to do the appropriate tests, and make the appropriate observations – to ensure that the issue has resolved and won’t return with a vengeance, or that some avoidable complication doesn’t crop up. There’s nothing like first-hand experience to help a doctor empathize with a patient. 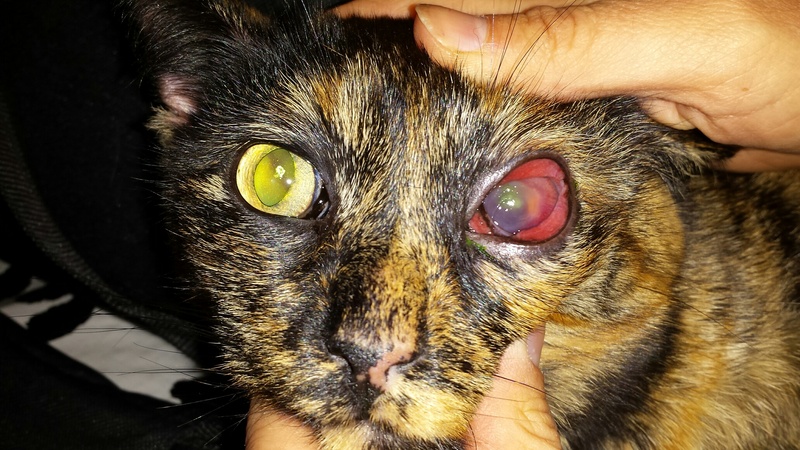 Not long ago, an attention-seeking kitten took a playful swipe at me, and scratched my cornea in the process. (The scratch was superficial – yay – but the discomfort was anything but.) I now have a good idea of just how painful an eye condition can be and just how badly a pet with a sore eye needs to be seen. We’ll see you when we see you. But where eyes are concerned, sooner is always better than later!